They will continue the campaign as long as funds are available. Update: The Church’s website has an option to donate to keep the campaign running (look about halfway down the page). Thanks, Mumblingsage! This gives me faith in humanity. 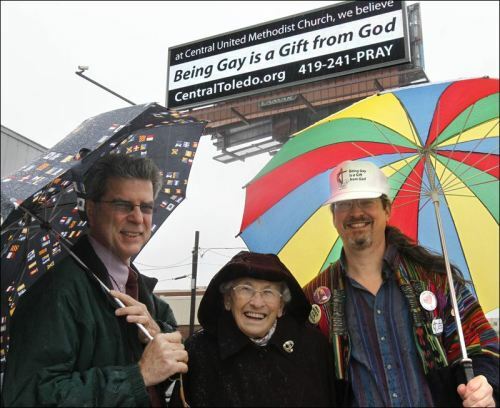 This is why I continue to follow the Methodist church. The local Fox affiliate was breathlessly interviewing some of the backwater rednecks that unfortunately infest My Fair City, and they’re all up in arms about this billboard, and about this group of Christians actually ACTING like Christians. To hear them tell it, the Apocalypse Is Nigh. With the exception of my time abroad as a teenager, I have always lived in Toledo, and I have always loved my hometown. And now I love it just a little bit more, because the folks at CUMC are taking a LOUD stand against ignorance and bigotry.